Your coloured glass splashback will be precision-cut, custom painted and installed with a flawless finish to make your kitchen or bathroom look even more stunning. Most companies use float glass with that common green tint. We only use the highest quality low iron glass for maximum purity and no green tint which can disrupt colours. Your glass splashback will be designed with the lowest amount of joins necessary for a more seamless finish. It will be completely custom designed to your exact tastes. We can even include elaborate designs and digital printing on the glass if you’re looking for something extra-impressive. We aren’t a one-man-band. We have a physical office where you can chat to staff about your project and even arrange evening appointments to suit you. We’ll visit your property, swiftly install your new glass splashback to make sure you’re delighted with the result and then tidy up after ourselves. A1 Glass and Glazing are trusted suppliers and installers of coloured glass splashbacks in Brighton, Hassocks, Lewes, Hove and East Sussex. The reflective qualities of light can transform kitchen spaces, creating the effect of space in smaller areas or adding focus to larger rooms. We have an extensive selection of finishes available in a full range of popular RAL colours. There is no limit to what our coloured glass splashbacks can achieve. Because they need no grout, the seamless qualities of our splashbacks ensure they stay clean and remain more hygienic than all other materials. They are also resistant to heat, tough and durable enough for use behind hobs and sinks. Alternatively, our splashbacks can clad full wall spaces for a more dramatic appearance. Our team can manipulate glass into any shape you require and this makes our coloured glass splashbacks perfect for every situation, particularly around sockets and switches. Once installed, splashbacks combine beautifully with light for naturally reflective qualities that let the beauty of the world shine through. Made from the most durable material, we can guarantee that your coloured glass splashback will protect your wall from the splashes and stains of everyday cooking. Each coloured glass splashback is designed and installed with no grouting seams, which means it provides your wall with added protection, eliminating the risk of extra damage normally caused. Provided in a range of high-quality colours, including a variety of patterns and designs, each glass splashback can be customised to suit the needs of your home. This ensures it fits with the aesthetics of your kitchen, creating a cohesive look. Our range of exceptional coloured glass splashbacks perfectly combine aesthetic and practicality, giving you the best product on the market. As it is made from a highly durable material, the colour glass splashbacks we offer are designed and manufactured to be easy to clean. They are guaranteed to be stain resistant, needing a quick wipe to keep it looking brand new. Unlike other options that contain grouting that can make it look worn and dirty, our glass option prevents that from happening. All our products are made with your best interests in mind, and the range of coloured glass splashbacks are no different. With each one being custom made, they are quality checked by a team of experts to ensure they can withstand high heats. This means they are guaranteed not to discolour, warp or come away from the wall during its lifetime. Using the highest quality of glass, we can guarantee that your coloured glass splashback is made to withstand any temperature. Unlike some splashbacks that may break or come away from the wall over time due to constant high heat, our range of coloured glass splashbacks are made to last, ensuring you won’t have to replace them soon. It is a common fact that glass water, bacteria and grease proof. This is why we use the highest standard of glass, ensuring it helps to keep your friends and family safe from unwanted germs and illnesses. 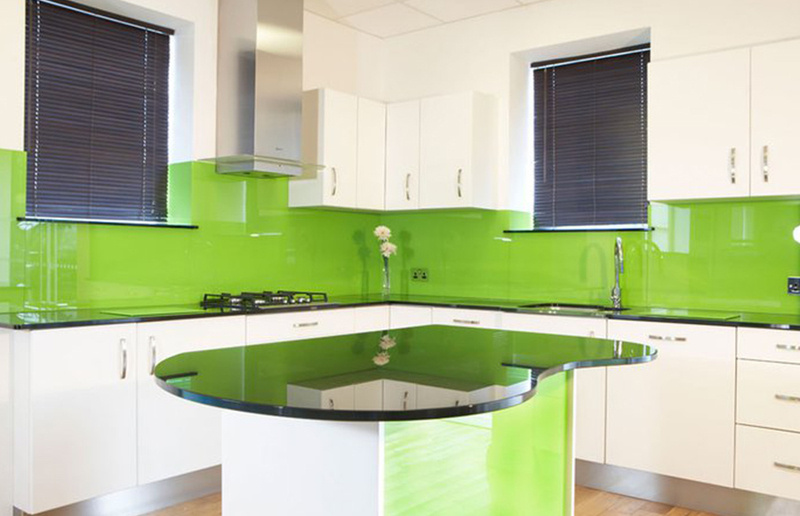 Each coloured glass splashback is easy to clean and maintain, making sure it stays looking brand new all year round. The aesthetics of each kitchen vary, which is why the price should reflect that. Depending on the colours and patterns you desire, each price will be different. 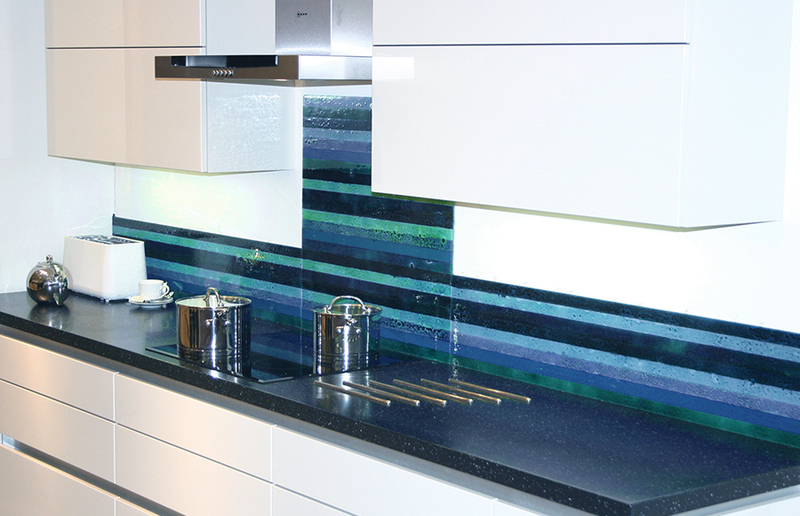 To find out how much your bespoke coloured glass splashback will be, give us a call today on 01273 676750. A member of our highly qualified team will be happy to help generate your bespoke quote based on your design specifications. Alternatively, use our online form to send us an email and a member of the team will get back to you as soon as possible.